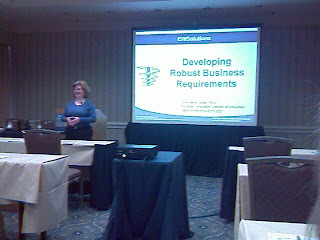 Anne Marie Smith was one of the first to kick off the 2008 conference on Sunday afternoon with her workshop on Developing Robust Business Requirements. In her usual lively style, she engaged the group in discussion and used fun stories from her family to illustrate key points. At one point she asked people to share their job titles. There were all kinds of titles, from IT specialist to data architect. Then she asked how many in the room saw their role as being primarily a business or data analyst, even if their title did not reflect that. The majority of participants raised hands. Interesting. She noted that we're a profession that is supposed to be semantically precise, but we don't even know what to call ourselves!